I luv being a Blogger! I get the chance to review items that are so practical and useful for my family! I also like that I get to share these items with my readers in a giveaway! This is one of those great items that I know you will luv to own for your self! •Small cube dimensions: 11" x 6.75" x 3"
•Medium cube dimensions: 13.75" x 9.75" x 3"
•Large cube dimensions: 17.5" x 12.75" x 3.25"
First, I wanna tell you that the shipping speed of eBags is AWESOME! These packing cubes arrived in a matter of hours from the time I ordered them. I ordered them one day and had them the very next day! Talk about Fast!!! These packing cubes are great to use for an over night trip or an extended stay at Grandmas house! I love this set of packing cubes. There is a size that is great for everything you may need when you are away from home! We travel a few times a year on our "Get away from it all" vacations. Those vacations are when we just decide we need a break from home and run away for a few days, usually on a long weekend or when every one just needs to unwind from school. These packing cubes were great for our last vacation! It has always been a struggle for me to pack. The hardest part about packing has been packing for my kiddos. They think that 1 outfit, swimsuit, pair of socks and a pair of undies will work for a week..:( This set of packing cubes has been a huge help. I used one cube for undies and socks and it keeps them all in placed wonderfully. I used another cube to hold their outfits and Pj's. The last cube was for my stuff:) I placed the outfits in the bags and zip them up and everything stayed in place from one destination to the next. Usually everything gets shuffled around and crinkled during the trip in the luggage. I don't have to worry about that. Everything is right where I put it. I love the colors and that they are vented to allow air to get into the bags.The packing cubes are lightweight and have easy to carry handles. When you are not using them they lay flat and are easy to store out of the way till you need them again! 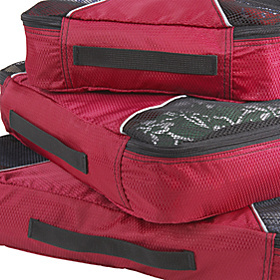 They weigh 12oz and are made of TechLite Diamond Nylon and have a Lifetime Warranty. eBags has many other sizes and shapes of their cubes! Check out eBags at their website HERE. The cubes that I received for my review are on sale at this time for ONLY $20.99. Run on over to eBags and pick you up a set for your next vacation. They come on many great colors! Giveaway~ Win your very own 3 piece set (color of choice) eBags Packing cubes. Enter below using the raffle copter form. There is one mandatory entry that must be completed before you can access the other entries. Giveaway will end Jan 14th at 12:01AM. Winner will be picked by Raffle Copter drawing and be contacted by email on the 14th. disclosure~ Thanks to eBags I received a 3 piece set of the eBags Packing cubes for the review. No other compensation was given. All opinions expressed are my own. I would use these when traveling...especially flying! Color would not matter at all. I love these, they would be great to take on all the trips my husband and I have been taking lately. I would prefer the black or blue, but all the colors look nice. I just love these and would use them every time I travel which is often between check ups at Duke, visits back home and at least 1 vacation a year. I love the orange one a lot. Yellow was nice too. What a great idea. I would use these for dance competitions. Angela has so much stuff she has to bring with her...shoes, costumes, make up, props, etc. Color wouldn't matter, but I do like the raspberry and the tangerine (ooh, anything that's a fruit sounds good. LOL). I really could use these! purr! I would use them to help me store clothes and jackets that I am not using right now in my closet. It would keep them neat and protected, and I would love to win them in the Titanium color. I would use these cubes for packing when I am traveling. I like yellow or blue best. Probably would want them in yelllow. these would be great or my sister as she's the traveler in the family. i really like the red or black. Love these bags, what a great idea to stay organized while traveling. My favorite is the raspberry color or tangerine. One for undies, one for top and one for jeans and jacket. I'd even use them to organize small items stored in my linen closet which have a tendency to get knocked off the shelf. 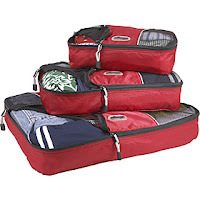 I would use to keep each persons clothes seprate when packing in outrlarge suitcase for our annual cruise...all the colors are pretty but i would prefer red or black as that matched or luggage! I would use these to help store my clothes when the seasons change. I love the raspberry color! I have some major road trips coming up this year and these would be perfect! I would pick canary! I would use them to store clothes. I like the Denim color. I would use them when traveling to visit my grown children. I would use them when I travel to visit my grown children, who live all over the country! These would be nice for out-of-season clothes storage. I like the Denim color. I'd use these to pack for trips, of course. They'd also be useful for storing out of season items. I'd use these for winter clothes. I like the canary but I'd have to go with the black. I would love the new yellow cubes to go along with the green and blue that I already own. Eventually I'd love to have four sets - one for each of us our family! I'd use these for traveling in the summertime. Love the red or green. Can't decide! I would use these when i travel and visit my out of town family! I love the Green color! We are moving, from NJ to AZ, so I would love to use these for when we are traveling. I like the green ones. These would be great for our family vacation this summer! I'd choose green! I would use them when I visit family and I'd choose green! Thanks for the giveaway! I would us them to travel. I would use them for organizing my closet in addition to packing. I love the green. I would use these for family trips! I hate having wrinkled clothes on trips from them moving around and etc in suitcases. So these would help fix that problem. I like the raspberry color! I'd use them for our weekey friday night racetrack stuff! It would be alot easier then taking 5 bags and just carrying the littleoes clothes and toys and blankets! Og and I'd like RED!! <3 as our Racecar is Red! I would choose the black colored ones. I think they would be great for traveling and be great use for sleepovers too. I would use these for when we go to visit my dad, looks like they would be perfect to keep in the tent without taking up alot of room...red would be my color of choice...but any would work. I would use them to store warmer clothes that we do not use for most of the year, and I would choose the rasberry color. I would use them to store extra clothes and other items in my house I have no place else to store. I would pick the navy blue. My hubs works out of town a lot, so I KNOW he'd make good use of organizing his suitcase with these! And I think I'd go with Red! I like the red! And i would use them for my son and the trips he takes with our church youth group! I would use them when I travel and I like the red one. Thanks! when my husband left us, i threw all of his clothes into our suitcases, and left them on the porch. he didnt bother to come in to explain why he was leaving and i was angry. so he took all our luggage. we would use these for the cheer trips we have to take this spring. and i love the royal blue ones, they match the cheer team colors!! thanks! I would use them to store clothes, I like the color canary.